The 70,000 square meters of retail space at this mall boast around 120 shops. These include apparel, jewellery, gifts, shoes, kids and toys, electronics and tech stores. Then you have some excellent cafes and restaurants, with a lavish food court. The balcony close to the food court looks over the San Felipe castle. But the mall’s main attraction is probably the famous 360-degree terrace, La Terrazza. With fantastic views of the surrounding city, the terrace has become a popular open-air venue for concerts and performances. 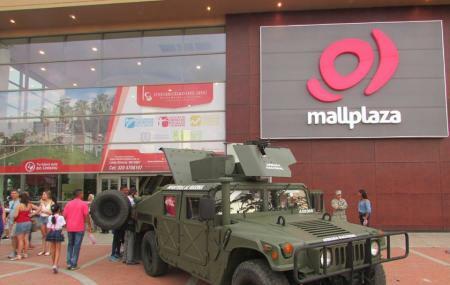 Check the mall website calendar to know about upcoming events! And if you’re here to just hang out, the mall does offer free Wi-Fi. By car or take a taxi. Nice shopping mall. Recommended if you are from another country. Security will request to open your belongings to verify you did not take something with out paying. In all Colombia YOU ARE GUILTY, YOU MUST PROVE YOU ARE INOCENT! Not fun shopping. In Colombia no one knows what's going on. Mall Plaza is a great shopping mall with all the amenities you would expect to find in any shopping mall anywhere in the world. It is not huge. You will find a good and big supermarket, many types of food in the food section, shoes, clothes and even an apple retailer. Good spot for shopping near the old city. I wouldn't say it's an excellent shopping spot, but it has a big supermarket (Jumbo) a big Toy Store (Pepe Ganga) and a big Retail shop (Fallabella). Food court is quite big too. A good place to visit if you're on vacations and realise you forgot something back home. Looking for food or any kind of purchase after visit the San Felipe Castle? Here is the perfect place. Is in the way going back to Centro if you're staying there.